Doing yoga at the wall can benefit your practice in myriad ways. For one thing, it can take the weight-bearing component out of asanas, which can be a godsend if you have a wrist or shoulder injury. The wall can also serve as a point of contact for refining alignment (consider, for instance, sitting with your back against the wall to maintain a tall meditation posture). Additionally practicing at a wall can assuage our fear in certain asanas, such as backbending and balancing poses—knowing something is there to “catch” you can be comforting. A wall-supported practice can also provide inspiration when asana begins to feel stale and dull. In the simplest of terms, it can be therapeutic, creative, and fun. Using a wall can make poses easier, and it can also turn up the volume on some poses, making them more challenging. 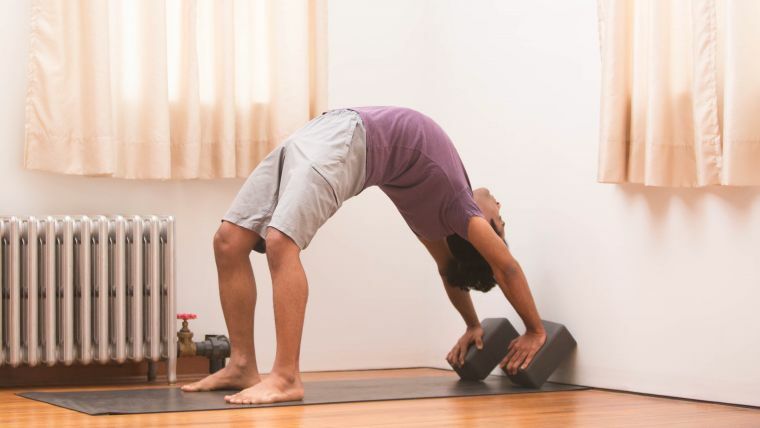 We’re going to explore here many of these benefits as they appear in the context of backbending by taking three popular backbends to the wall: a standing backbend, wheel, and camel. The variations below can either be added to a full wall sequence or incorporated into your regular practice. Be sure to warm up first with a well-balanced practice that includes chest openers, quad and hip-flexor stretches, and less-intense backbends. When I first began practicing yoga, the studio I attended had a ballet barre on the wall at the back of the practice room, presumably for barre classes. During standing backbends, the teacher would often tell us to reach back for that barre. While I knew I couldn’t literally touch the barre with my hands from my second-row spot, I still tried to bend as low as possible. (And with cues like “go as far back as you can go,” it makes sense that I would!) Doing so always left me feeling way too compressed in my lower back. And, to be frank, it was also scary to fall way back into that abyss—relying only on the strength of my lower back, which felt inherently unstable. These days, I often practice this pose while standing in front of a wall, with my back facing it, and reaching back for a spot that I can actually reach. I also focus on lengthening my spine and lifting, opening, and expanding my heart first and foremost, then reaching back. As someone who sits a lot working a nine-to-five, and has a tendency to hunch, I love the feeling of release I get throughout my upper body when my chest and shoulders open up. • Stand about a foot away from the wall (or a little more if you like, to allow for a deeper backbend), facing away from it, with your feet two fist-widths apart (or a little wider if that’s more comfortable). You’ll be closer to the wall than you would be if setting up for a dropback prep, aka “walking your backbend down the wall.” Roll your shoulders up, back, and down. Bring the back of your head in line with the back of your pelvis and your chin level with the ground. • Breathe smoothly. Inhale and exhale deeply through your nose. As you exhale, root down through your feet. As you inhale, imagine growing taller and lengthening through the crown of your head. Take several deep breaths here. • Then, on your next exhale, engage your lower belly. To activate your inner and outer legs and create stability in the lower body, imagine that there is a block between your thighs (or even place one there), and press your inner thighs into the (real or imaginary) block. At the same time, press your feet down and isometrically move them away from each other. • Keeping your lower body energized, raise your arms overhead. Spin your pinkies toward each other to externally rotate your upper arms (you’ll feel your upper back broaden as you do this). Keep that rotation in your upper arms as you turn your palms to face forward. Lengthen through the sides of your waist to grow even taller. • Then, begin lifting your heart toward the ceiling as you gradually begin to reach your fingertips toward the wall behind you, keeping your neck nice and long. See if you can touch the wall. • You may be able to walk your fingertips down the wall slightly. If you do so, perhaps you’ll feel the stretch travel into your abdominals. • Stay for three to five breaths. • Come out of the pose on an inhale, leading with your heart and pressing your hands away from the wall as you rise up, releasing your arms to your sides and returning with control to standing. Note: If you feel discomfort in your lower back, it means you’ve gone too far—and in that case, walk your fingertips back up or even come out of the pose. Wheel is one of my favorite poses. I love the deep feeling of release I get along the front of my body, not to mention the metaphoric opening of the heart. The following variation offers even more lift, and is potentially easier on the wrists than the classic form of the pose. You’ll need two blocks. • Arrange your mat with its short edge against the wall. Place two blocks on the mat against the wall, about shoulder-width apart and at their lowest setting (length-wise). The blocks can either be flat or at an angle (which decreases the amount of wrist extension, and thus discomfort). Then lie on your back with your head between the blocks and a bit of space between the wall and the crown of your head. The ends of the blocks should be in line with your shoulders, so adjust as necessary. • Bend your knees, and place your feet flat on the floor, stacking your knees over your ankles (or close to it). • Place your hands on the blocks, with your wrists facing the wall and fingers pointing down, hugging the front edges of the blocks. • Resist your elbows in toward each other (don’t let them splay!). Again, imagine that there’s a block between your thighs (or even place one there) to keep your knees from splaying out. On an inhale, press your hands down into the blocks and press down through the soles of your feet as you straighten your arms to come into wheel, lifting your hips and heart away from the floor. Keep the back of your neck long and your thighs hugging the real or imagined block. Draw your chest toward the wall and reach your thighs away from the wall, finding a nice, even backbend from the low back to the upper back. • To exit, bend your elbows, tuck your chin toward your chest, and with control, slowly release to the floor, bringing your upper back to touch the ground first. Note: The above variation can be particularly beneficial for people with a shorter arm-to-leg ratio as it lengthens the arms. Similarly, placing blocks under the feet can lengthen the legs for people with shorter legs (see variation below). This variation will decrease the stretch required in the hip flexors. At least in my body, however, I find it requires more upper body strength because more weight is being transferred into my arms. • Place the blocks—lengthwise, at their lowest setting, and about hip-width apart—against the wall (having the ends of the blocks against the wall will keep the blocks from sliding). The blocks should be flat, not angled for this one. • Lie down on the mat, bend your knees, and place your feet on the blocks. Adjust as necessary to stack your knees over your ankles (or close to it). • Place your hands on either side of your ears, fingertips pointing down toward your shoulders. Resist your elbows toward each other and press down into your hands and feet as you press up into wheel. I cringe when I think about the first time I practiced camel pose without the supervision of a yoga teacher. It was just before a yoga class, only a month or two into the first year of my practice. What I ended up doing was some kind of bowed supta virasana variation, which is far from camel pose—and it hurt my back. As I leaned back, a fellow yogi and friend approached. “Oh, I hate, hate, hate” that pose, he said. And I would have too if I continued practicing it that way! I wasn’t ready to grab my feet, but I wanted to, so I leaned too far back. Then, one afternoon in yoga class, a teacher introduced us to camel at the wall. I discovered how to practice the pose with more integrity. The wall helped me become aware of the orientation of my hips in space as I learned to access the shape of camel pose. • Place your hands on the back of your pelvis, with your fingers pointing up or down (whichever you prefer). Press your knees down and resist your thighs apart. This engages your abductors (outer thighs), which further stabilizes your lower back. Engage your lower belly and lengthen through the sides of your body and up through the crown of your head. • Then begin to peel your chest away from the wall, broadening and lifting it as you move into your backbend; keep your thighs and hips against the wall, and keep the back of your neck long. • Your hands can stay on your pelvis, or you can reach for your heels. If you reach for your heels, reach back with both hands at the same time to avoid twisting (simultaneously rotating the spine and backbending can irritate your lower back). • In your chosen variation, continue resisting your thighs apart, lengthening through your spine, and pressing your quads and hips into the wall. Continue to lift and broaden through your chest, keeping the backbend primarily in your upper back. You can gaze at the wall or let your head follow the movement of the backbend, gazing toward the ceiling if that feels comfortable for your neck. • Exit on an inhale, rooting down through your knees, and lead with your heart as you rise back up to your starting position. Note: If you feel any pinching or discomfort in your lower back in camel, you’ve gone too far. Come out of your chosen variation slowly, with control, then try again (when you’re feeling up for it! ), but only backbend to your comfortable capacity. I hope these variations help you, as they’ve helped me, to find more integrity and spaciousness in these three classic poses.